Proud and delighted of our recent reviews! Excellent property spotlessly clean, beautiful décor, off road parking warm and friendly welcome, great local knowledge and advise on area. This place and the host are 5 star would stay here again if anywhere near where we were visiting." Mr. & Mrs. Markham, stayed July 2018, source Booking.com. Excellent reception and very friendly lady who made us feel very welcome on our arrival. We were very lucky to find such a lovely place at a really good price. Well worth it! We will stay here again! There is nothing to dislike!" Liam, stayed August 2018, source Booking.com. "From the moment you walk in the door and look around the attention to detail in furnishings and decor show no expense has been spared in producing this remarkable boutique and bijou hotel. And the breakfast is equally pleasing. Any request seems to be stored in Linda's memory and your wish is then granted! A bonus is the fact you can get to London St Pancras in 20 minutes by train. We were here though as we were attending a wedding in St Albans and wanted a hotel away from the main reception. We made a long weekend of it and this accommodation proved perfect. 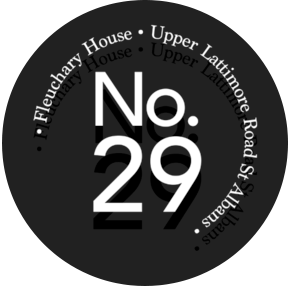 We will certainly be using number 29 again when we are next in the area." Mrs. & Mrs. Cox, stayed July 2018, source Trip Advisor. "My partner and I stayed here for a weekend in St Albans and were both very impressed with all the attention to detail and warm, welcoming feel of this guest house. The host, Linda, is very friendly and obviously puts a great deal of care into the place, as nothing is overlooked. We highly recommend this place to anyone looking in the area and hope to stay again the future!" Alex and Jennifer, August 2018, source Trip Advisor. "Best B&B I've stayed in. Linda was so welcoming and nice to us and her and John have an amazing place which is comfy with spacious rooms as well as being close to everything (but quiet). Millie the dog is v sweet and friendly. If/when we ever stay again in St Alban's this will be top of list. Thanks so much for our stay." Paul Carter, stayed June 2018, source Google. “Having stayed at Fleuchary House for a number of years now, whenever we visit our daughter from our home in Aberdeenshire, we have got to know Linda well. Always a kind and attentive host, we were thrilled when she kindly agreed to allow us and our daughter to use the B&B as the base for the preparations for our daughter’s wedding! From helping us to hang up the wedding dress in our room a couple of days prior to the wedding; opening up the house for the photographer, florist and the excited bridal party on the big day, to providing a wee dram for the nervous ‘father of the bride’, Linda generously allowed her home to become our home and nothing, but nothing, was too much trouble for her. She even provided the most exquisite glasses for the bubbly that was served prior to the bridal party setting off for the wedding venue, as well as kindly printing out the table plan lists for us after they had been revised for the umpteenth time right at the last minute, averting a mini crisis along the way! We were so, so grateful to Linda and her wonderful staff for their generosity, care and attention in the days leading up to and following such a special family occasion and for helping to keep us calm and relaxed on the day, (well, as much as possible in the circumstances!). Innes and Sarah, stayed August 2018, source Tripadvisor.